Spital Square was laid out in the 1720s and 30s on the site of the earlier Spital Yard. That in turn stood on the site of the Augustinian Priory and Hospital (hence the abbreviated name ‘Spital’). The hospital had been the first major building on the existing farmland, and was founded in 1197. Henry VIII’s Dissolution of the Monasteries signed its death warrant in 1539, and the area subsequently housed a mansion called Spittle House, on the site of the present St Botolph’s Hall. Tenements were built and demolished before a much grander development was undertaken in the early 18th century. St Botolph’s Hall itself was built in 1891 and used by the Central Foundation School for Girls. Its richly detailed red brick and terracotta façade is a distinctive landmark in an area that has seen much recent change. 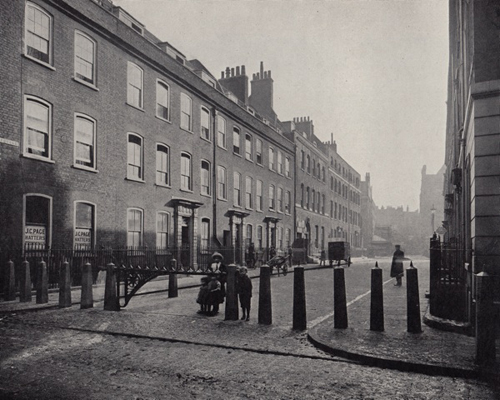 For most of its history, Spital Square was protected from noisy through-traffic by narrow entrances and bollards. This changed in 1917, when the eastern entrance was opened to market traffic, and again in 1929, when the historic narrow entrance from Bishopsgate was widened to from 19 feet to 48 feet. The demolition of many houses continued, until the 1970s when determined efforts by the Spitalfields Historic Buildings Trust succeeded in increasing awareness of the historic and architectural value of the surviving 18th century buildings and townscape. In recent years, a number of major office developments have been completed or are under construction, particularly just outside the Conservation Area to the south and west. 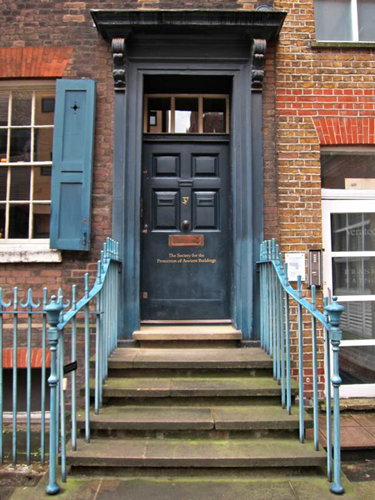 37 Spital Square is the only surviving 18th century house – a 3-storey brick structure which is now the headquarters for the Society for the Protection of Ancient Buildings. The probable builder or first occupier of the present 37 Spital Square was Peter Ogier III. The Ogiers were a prominent, wealthy French Huguenot family. As a boy Peter III had been smuggled out of France as a religious refugee. His family had settled in Spitalfields and had prospered as silk merchants. In 1740, Peter III was in his late 20s and had probably just inherited following his father’s death. This perhaps provided the finances needed for work to, or acquisition of 37 Spital Square. The building’s plan form is mostly typical of London houses of the earlier 18th century, though the first flight of the stair would more commonly be against the outside wall. The entrance passage leads to the yard and to a stair in the rear half of the building. Each floor has two rooms. Though the first owner was no doubt wealthy, his builders still made use of re-cycled local materials. Some of the smaller Purbeck stone slabs in the building’s rear courtyard are thought to have come from the Priory, and the foundation to the central wall in the basement is constructed from re-used medieval stonework. Beneath this corner of the old square lie the remnants of the old Augustinian hospital. The south transept of the Priory Church lies beneath what is now number 37. It appears that the house remained connected with the silk-making industry until the 1880s, towards the end of the period being used jointly with No 36. Robert and Ann Senecal lived at 37 Spital Square and when he died his son Robert (1838-1895) and his wife Rosabel (1840-1908) came to live there. The census of 1881 lists Robert Senecal of 37 Spital Sq, Silk Manufacturer employing forty hands. 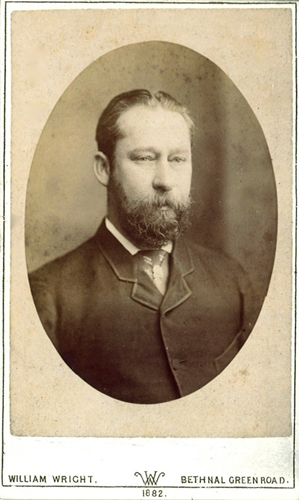 He had relinquished the trade and moved to Stoke Newington by the time of his death. During the first two decades of the 20th century the house was occupied by the Greensteins – Jewish immigrants from Russia, who made leather bags and purses on the site. The house then entered a period of decline and was subdivided for multiple commercial uses. After World War II it was occupied by the umbrella company James Ince & Sons. 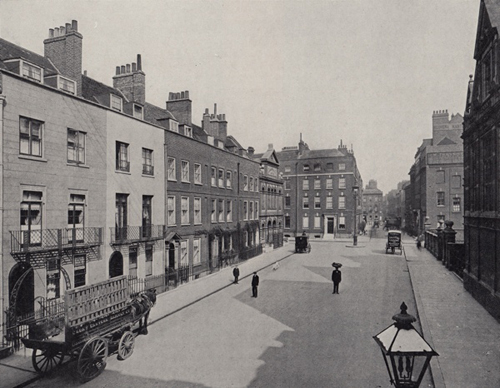 By the latter half of the last century, so much demolition and redevelopment had taken place that number 37 was the only Georgian house left of the old Spital Square. 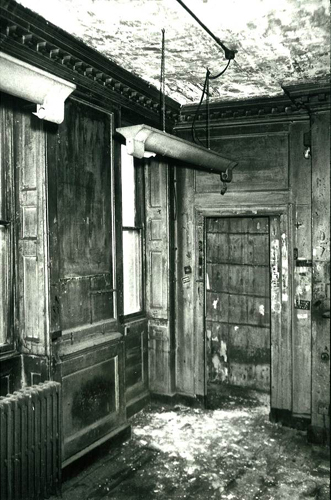 By the time SPAB took up residence in 37 Spital Square in 1981, the house was in a state of dereliction and in urgent need of repair. Major work was carried out by Julian Harrap Architects and the house was decorated in a manner felt appropriate at the time. I was employed to carry out an analysis of the decorative schemes in the entrance hall, stairs and the first floor rooms. The early decoration was found to be almost identical to that found on the other similar buildings of the 1730s that I have investigated. 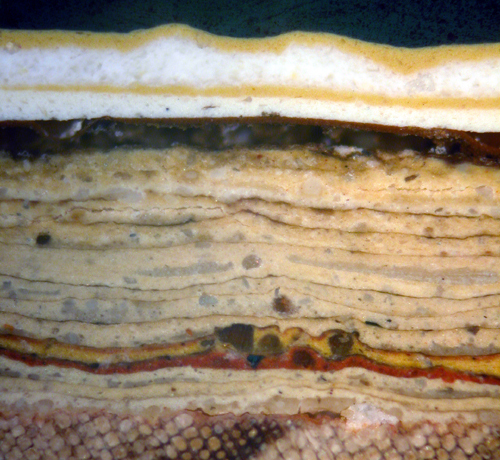 An idea of the general treatment of the period can be seen here. 4) Elder Street Conservation Area. London Borough of Tower Hamlets. Adopted by Cabinet: 7th March 2007. 5) Information supplied by SPAB. 1Do the static figures in this scene not remind you of that iconic image from L’Année dernière à Marienbad ?